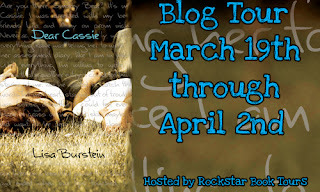 Hello and welcome to our tour stop on the Dear Cassie Blog Tour hosted by Rockstar Book Tours. Our review is below followed by a giveaway. Thanks for stopping by! Cassie and her two friends, Lila and Amy, were stood up on prom night and decided to retaliate by breaking into the house of one of their boyfriends and stealing his stash of marijuana. The girls get busted and Cassie finds herself heading to a 'camp' in lieu of jail time. At Turning Pines Wilderness Camp, she rooms with two girls, Nez and Troyer, and has to spend 28 days doing manual labor and writing about things, like herself, in a journal. Dear Cassie is a companion book to Pretty Amy, which I did not read (I read the second Pretty Amy book, The Next Forever). It's not necessary to have read the other books but there are references to a past incidence so it is helpful. Actions have consequences to handle and Cassie has no choice but to abide by the judge's rule. The story revolves around Cassie's journey from a stubborn, mad, 'tough girl' to a more mature and regretful young woman who realizes in order to be happy with another person, she has to first be happy with herself. I liked Ben from the opening scene and really liked Cassie's views on things. Her voice reflected so much of what she had endured growing up and at times her words were raw and emotional which made for a gripping read. I'm glad the author didn't make this a conventional romance because these are not typical characters. I did want some more depth in parts, especially when it came to better understanding Cassie. I liked the diary format but the title headings with the f-bombs lost their shock factor/impact quickly. I found the cover art a bit misleading with the couple looking like this is a heavy romance. It isn't. What Dear Cassie does is show us how one tough-talking teen has to let go of her old ways, forgive herself for past misdeeds and learn to live. Cover comment: As I stated in my review I find the cover cute but misleading. Book source: I received a promotional copy in return for my honest review. There is a tour wide giveaway for 1 paperback copy of DEAR CASSIE (US Only) and one eBook of DEAR CASSIE (International). I've got DEAR CASSIE on my wish list!! Yes.. i have read some great reviews about this book and i would like to check it out!! Thanks for the giveaway!! It looks like a story I would enjoy so I am looking forward to reading it. 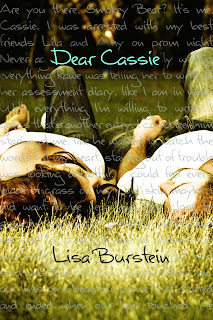 I am totally looking forward to reading Dear Cassie! I really like deep insightful books about life-changing events. I find them some of the most interesting. I hope I win so I can read this because it sounds super amazing!! !